Hey thanks to everyone who stopped by to say hi and buy t-shirts and DVDs at our booth at BikeCraft. We had a great time, even if we had trouble breathing because there were so many people there. We estimate about 1,500 people attended and the hall was packed at 5:00, a half hour before the event was scheduled to open. And it stayed packed until 8pm, and full until 9:30. We had a great time sharing our booth with our neighbor-friend Nikki who lives down the street from the Filmed by Bike headquarters. I was so distracted by all the people stopping by to say hi that I forgot to many pictures. Here are a few on our slideshow. 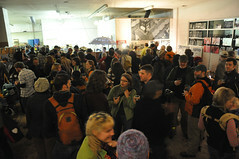 You can find more from BikePortland on their slideshow. This entry was posted in biciculture, Events. Bookmark the permalink.